This year I was able to attend 69 features during the 16 days of the festival, 5 more than last. The slate of 2013 films was not as strong compared to 2012, but the overall festival experience this year was more enjoyable. A most welcome change was the elimination of the early morning passholder lineup. In previous years passholders were required to queue up early every morning to reserve a ticket for each show they wanted to see that day. This year, you just joined a designated line outside the venue before showtime. This made it possible for me to sleep in most days. Aside from a persistent issue with the handheld barcode ticket scanners (it would often take several attempts to get scanned in), I was impressed by the overall smooth handling of lineups and theatre loading. Respect to all the staff and volunteers, even with some unusually short turnaround times, there were only a couple of instances where the following show started late. Although the venues were more spread out than in the past, scheduling was usually friendly enough for you to get from one place to the next on time. Most impressive was the huge 50 foot screen at the 1,800 seat, Moshe Safdie designed, The Centre in Vancouver for Performing Arts. Last year it was used only once, during the closing gala screening of Holy Motors (I did not attend), but this time around, it was host to over 40 films. I had some doubts about the quality of presentation on a temporary screen in a venue of this size, but they've done a fantastic job with the setup here. A nice bonus was the no food or drink policy, it helped to keep the distracting crowd noises to a minimum. 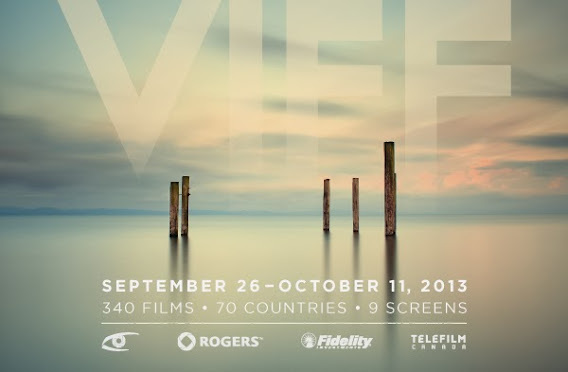 I hope VIFF is able to secure this location again for 2014. Another temporary screen was installed at The Vancouver Playhouse, a 668 seater normally used for live theatre and other performance arts. This venue had the best sight-lines overall. The stadium style curved seating, and the unique placement of the screen due to the size and shape of the permanent stage, meant that even the very first row provided an excellent vantage point. The only drawback were the acoustics of the building. Since it was designed to carry unamplified voices to the rear of the house, sounds reverberate and echo more noticeably in here than in a traditional cinema. The newest venue was at the SFU Goldcorp Centre for the Arts. A 350 seat lecture hall opened in the fall of 2010, and upgraded for VIFF with a digital projector and sound system. The screen and sound here were excellent, but there's room for improvement in the projection booth. I noticed on multiple occasions, problems with the sound feed, wrong aspect ratio, incorrect cropping, and sometimes the house lights were left on well after the film had started. Those are minor wrinkles that will no doubt be smoothed over with experience. Not much can be done about the uncomfortable seats however. For ten days, shows were also held at 3 of the 12 screens at the Cineplex Odeon International Village. It's one of only two remaining multiplexes in the city centre, and a long time favorite of mine. Sure, it's located at the edge of one of the shadiest looking neighborhoods you will ever encounter, but it was the first with reclining seats, and has a history of offering first-run festival style films throughout the year. In a perfect world, VIFF would have the funding for 6 screens here for the entire duration. The last, new to VIFF venue, is The Rio. A 420 seat, single screen venue originally built in 1938. It's a little out of the way compared to the others, requiring a vehicle or transit to get there, but its a cool and comfortable place. Renovated not long ago, with nice plush seats, adjustable armrests, and a concession licensed to serve alcohol, this was the perfect home for VIFF's new midnight movie series, Altered States. Hopefully, for many years to come. wow, 69 films in 16 days, anything you regret not seeing at festival? I'll check back for the full reviews. Seems most of the impact is where you watch it there. I'd love to watch just one film on such a special stage some day. Wow, you did an amazing job. Give yourself a vacation. I would be tired if I saw that many films in the span of a few days. Great to see Japanese films in your final list! They were emotionally rich and rewarding but I have to say that those two don't compare to Sion Sono's latest title, Why Don't you Play in Hell? I'm still mind-blown after watching it! WOW! 69 features during the 16 days, that's quite a feat. Congrats Bonjour and thanks for the coverage. If only I could cover TCFF as well as you! web inventory smarter and hot property on the Web.